The home Jaguars win 11 of 14 matches en route to a lopsided win over the Falcons. It's crunch time for high school wrestlers. As the dual season winds to a close, Century, Liberty and teams like them are honing their skills in preparation for the district and state championships that lie on the horizon. The Jags and Falcons faced-off Thursday, Jan. 31, at Century High School, in the teams' last head-to-head contest before the Pacific Conference District Championships scheduled for Friday and Saturday, Feb. 15-16, at Forest Grove High School. On this night, it was all Century, as the home Jaguars defeated Liberty 55-18. Century won 11 of the 14 matches, including six by fall and two more by technical fall. With the win, they improved to 4-2 in duals, but despite the somewhat lopsided victory, head coach Guy Takahashi said his team still has work to do in order to get where they need to be by districts. "We still need to be a lot more disciplined in basic positioning," said the coach. "The other stuff is coming, were in decent shape and they know enough and are competing, but we need to fire it up another notch. We're getting there, and I think by districts we'll be where we need to be with this team." The night started with Century jumping out to a 9-0 lead on the backs of a Jordan Salvador decision, followed by a fall by Sean Cabanban at 113 pounds. 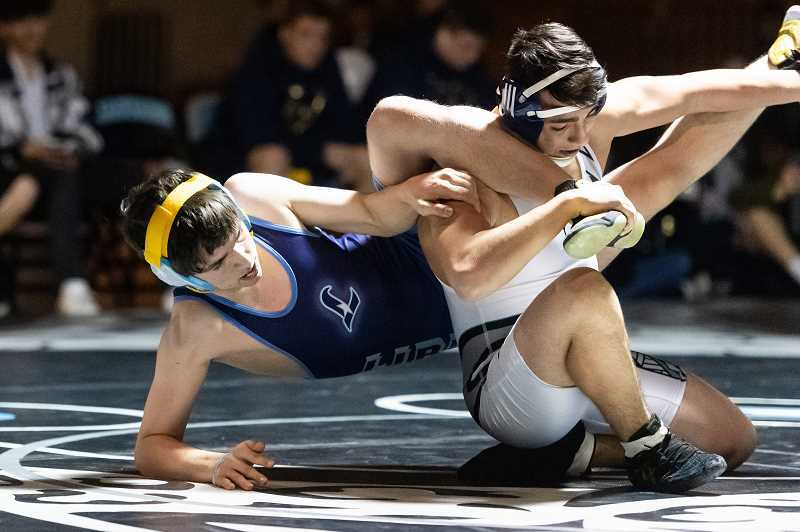 Liberty responded when Bennet Parkinson pinned the Jaguars' Tanner Santesson 1:36 into the 120 pound match's second round, cutting the lead to 9-6, but Century's William Musser, Uriel Rodriguez and Davin Chamberlain all posted wins, reestablishing the Jaguars' lead, 23-6. From there on it was mostly all Jags. The Falcons' Octavio Leon got a pin in the 145 pound weight division and Donovan Gallardo did the same at 170, but aside from that, Century's Ernesto Alvarez (152), Jesse Hendren (160), Agustin Aguas (182), Loudyn Reese (195) and Va' atausili Tofaeono (220) all won matches leading into what would be the night's most interesting match, a heavyweight duel between the Jags' Brody Reese and Liberty's Rafael Hinojosa. 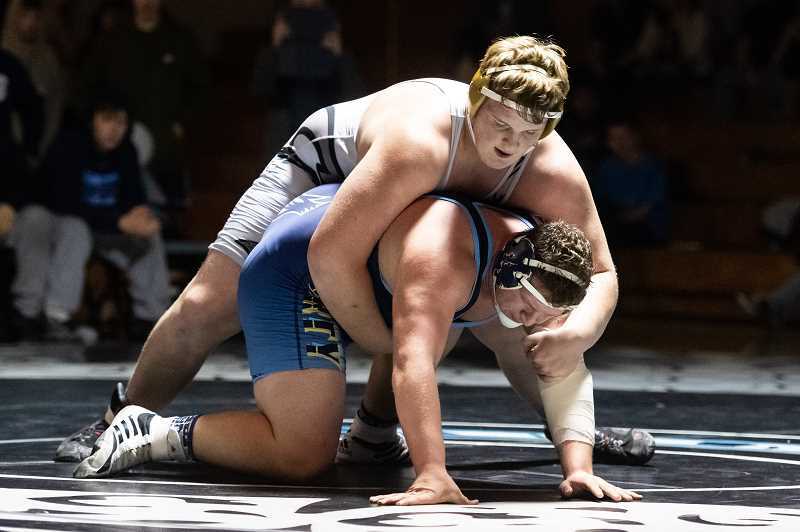 The two behemoths, both state contenders at 285 pounds, battled evenly through regulation time, then stood pat through overtime and two tiebreakers before Reese won the Ultimate Tiebreaker. Takahashi said that relatively speaking he was pleased with his team's effort, but said that in order to be at their best, they'll have to do so with a more aggressive approach. "They're doing a pretty darn good job, but I think we can do better," said the coach. "We'll get there, but it's a young team and I think after the Newberg match we took a bit of a step back. They wrestled more conservatively then they should've tonight, and we need to be more aggressive." Century will wrestle in the Bill Geister Invitational at Clackamas High School, Friday, Feb. 1-2, then have two weeks to rest up for the Pacific Conference Championships. Liberty has one more dual, a home match with Newberg Thursday, Feb. 7, at 7:00 p.m. at Liberty High School.